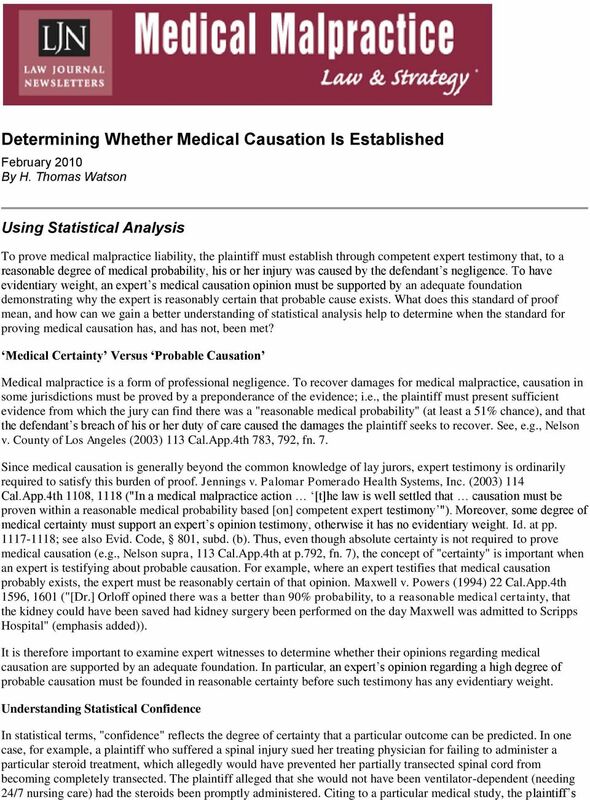 Download "Determining Whether Medical Causation Is Established"
2 medical expert testified he was "95% certain" that, had the steroids been administered, the cord would not have completely transected and the plaintiff would not have been ventilator-dependent. The medical study cited by the plaintiff s expert actually showed, to a statistical confidence of 95%, that there was a 53% likelihood the steroid treatment would be effective for spinal injuries. The expert s testimony, while technically correct, was highly misleading since it suggested there was a 95% chance that steroids would have been helpful when, in fact, there was only a 53% chance that steroids would have made a difference. Effective cross-examination could have clarified this testimony by forcing the expert to admit, based on the very study he cited, that he was only 95% sure that there was a 53% that steroids would have prevented the spinal cord from becoming completely transected. Statistical analysis can be used to test the certainty of an expert s testimony. For example, suppose an expert testifies he or she is 99% sure there is at least a 75% chance that a particular test or therapy would have lead to a particular result. Statistical analysis using the formula for calculating the number of observations required for a 99% confidence interval (where there is only a small random sample of a large population) suggests that the expert s testimony may not be credible if his or her opinion is based on fewer than 1875 observed cases. (The formula for determining the standard error of a proportion (for a small random sample of a large population) is óp = (pq/n)1/2 where is óp is the standard error of the population, p is the probability of a success, q is the probability of a failure, and n is the number of observations. Plugging this testimony into the above formula: 0.01 = (0.75*0.25/n)1/2 and solving for n yields 1875 observations. This means that, if the expert has observed fewer than 1875 cases, then his or her testimony about being 99% confident may not be credible though a more precise statistical analysis (by an appropriate expert) is needed to determine the actual confidence level under the circumstances.) Proving that the expert s causation opinion is not credible based on the foundation for that opinion may require the testimony of a statistician. However, as shown in the examples below, subjecting expert testimony to rigorous foundational examination and statistical analysis may be critical to establishing a causation defense, especially in cases involving a series of statistically dependent events linking the alleged malpractice and the plaintiff s injury. 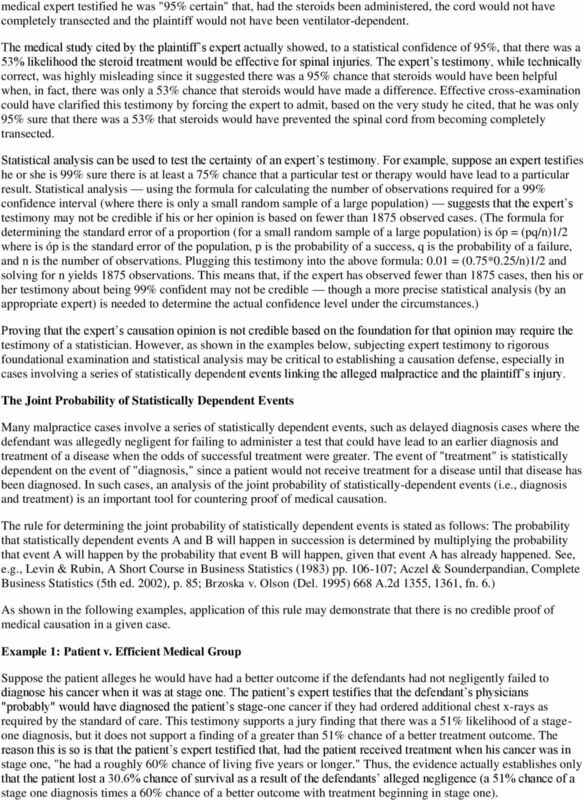 The Joint Probability of Statistically Dependent Events Many malpractice cases involve a series of statistically dependent events, such as delayed diagnosis cases where the defendant was allegedly negligent for failing to administer a test that could have lead to an earlier diagnosis and treatment of a disease when the odds of successful treatment were greater. The event of "treatment" is statistically dependent on the event of "diagnosis," since a patient would not receive treatment for a disease until that disease has been diagnosed. In such cases, an analysis of the joint probability of statistically-dependent events (i.e., diagnosis and treatment) is an important tool for countering proof of medical causation. The rule for determining the joint probability of statistically dependent events is stated as follows: The probability that statistically dependent events A and B will happen in succession is determined by multiplying the probability that event A will happen by the probability that event B will happen, given that event A has already happened. See, e.g., Levin & Rubin, A Short Course in Business Statistics (1983) pp ; Aczel & Sounderpandian, Complete Business Statistics (5th ed. 2002), p. 85; Brzoska v. Olson (Del. 1995) 668 A.2d 1355, 1361, fn. 6.) As shown in the following examples, application of this rule may demonstrate that there is no credible proof of medical causation in a given case. 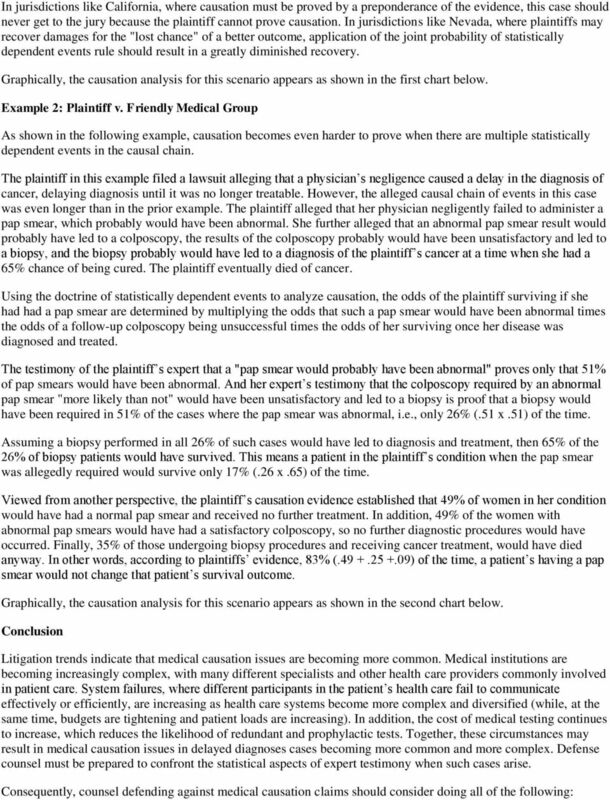 Example 1: Patient v. Efficient Medical Group Suppose the patient alleges he would have had a better outcome if the defendants had not negligently failed to diagnose his cancer when it was at stage one. The patient s expert testifies that the defendant s physicians "probably" would have diagnosed the patient s stage-one cancer if they had ordered additional chest x-rays as required by the standard of care. 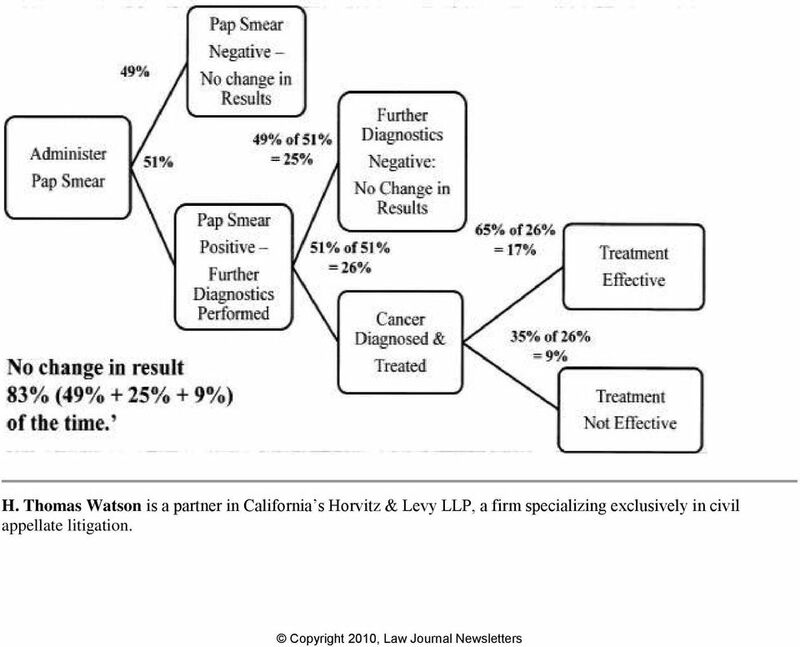 This testimony supports a jury finding that there was a 51% likelihood of a stageone diagnosis, but it does not support a finding of a greater than 51% chance of a better treatment outcome. The reason this is so is that the patient s expert testified that, had the patient received treatment when his cancer was in stage one, "he had a roughly 60% chance of living five years or longer." 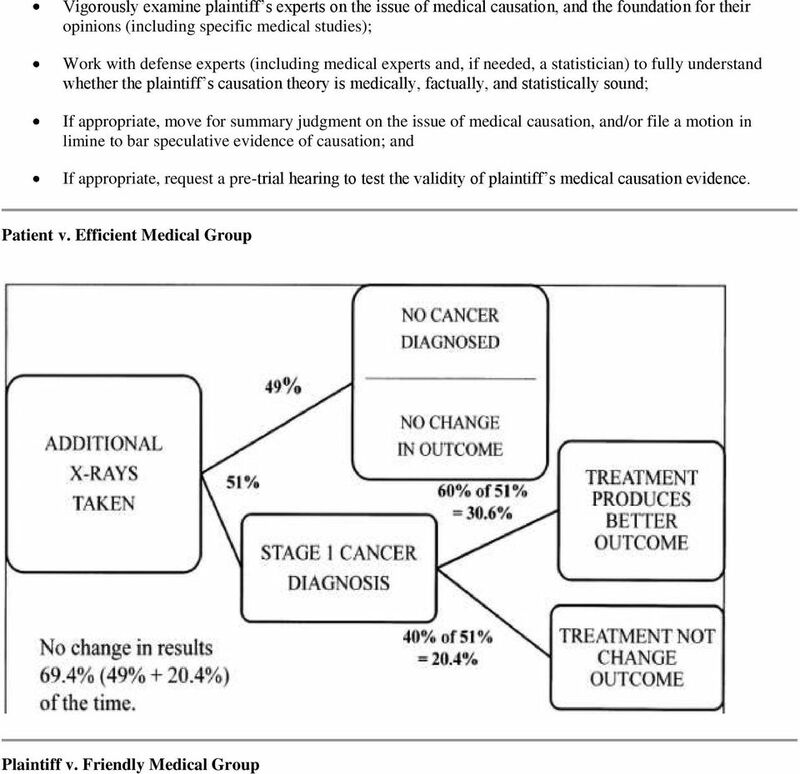 Thus, the evidence actually establishes only that the patient lost a 30.6% chance of survival as a result of the defendants alleged negligence (a 51% chance of a stage one diagnosis times a 60% chance of a better outcome with treatment beginning in stage one). Today I will discuss medical negligence following a number of recent high profile cases and inquests. v. Record No. 960876 OPINION BY JUSTICE ELIZABETH B. LACY April 18, 1997 ROBERT J. PARISER, M.D., ET AL. Appeal from the Judgment entered June 15, 1999 in the Court of Common Pleas of Cambria County, Civil, No. 1995-1519. Filed 10/26/00 CERTIFIED FOR PUBLICATION IN THE COURT OF APPEAL OF THE STATE OF CALIFORNIA SECOND APPELLATE DISTRICT DIVISION ONE MARINA EMERGENCY MEDICAL GROUP et al., Petitioners, No. B142473 (Super. User Name: DOREEN LUNDRIGAN Date and Time: 11/11/2013 2:02 PM EST Job Number: 6148476 Document(1) 1. Kapsch v. Stowers, 209 Ga. App. NO. COA12-1099 NORTH CAROLINA COURT OF APPEALS Filed: 16 April 2013 JEFFREY HIGGINBOTHAM, Plaintiff, v. Durham County No. 10 CVS 3136 THOMAS A. D AMICO, M.D., and DUKE UNIVERSITY HEALTH SYSTEM, INC., Defendants. This opinion will be unpublished and may not be cited except as provided by Minn. Stat. 480A.08, subd. 3 (2012). PRACTICAL TIPS FOR TRYING MEDICAL NEGLIGENCE CASES Source: Superior court judges Richard Doughton, Ed Wilson and Catherine Eagles (handout prepared for October 2009 Superior Court Judges Conference) I.